Born in Brampton, Cumbria, Derek's first show business appearances were as a ventriloquist, mainly in local clubs, but by 1960 he had become a presenter/interviewer for Border Television. Having been impressed by a Canadian game show he had seen, Derek re-packaged the format and pitched it to his company as "MR. and MRS".. 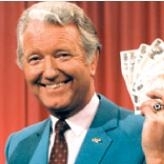 This became a hugely successful television show for many years, with Derek as presenter. He also took it on the road as a stage show. Other T.V. shows he fronted included "Look Who's Talking" and "A Century of Stars" (1984); a one-off documentary about the GOWR. Derek was also Assistant Controller of Programmes for Border T.V.. He leaves a wife, Edith, and a daughter, Diane.